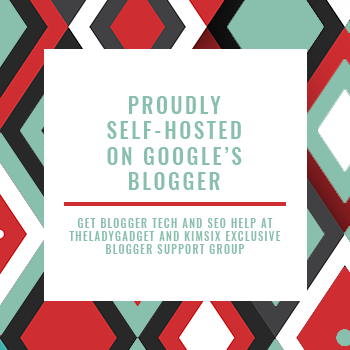 When I constantly mention using a specific food or ingredient on the blog, but never discuss the reasons why, I feel like I'm doing my readers a disservice. I've made several dramatic changes to my diet in the past several months and if you're a regular here, you'll likely have noticed. I no longer use fat-free or low-fat dairy products and non-fat cooking spray. I only buy organic, whole milk grass-fed dairy products, grass-fed beef, humanely raised pork and am working toward only purchasing humanely raised chicken. At some point, I want to write several posts dedicated to those dietary changes. Keep and eye out for them. Today, though, I'm focusing on my switch to only buying 100% pastured eggs. 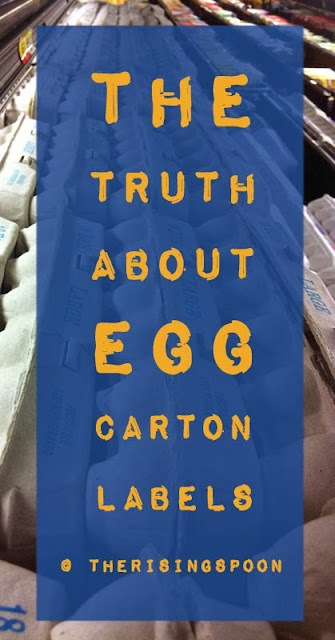 For years I've skeptically questioned the labels on egg cartons and discovered that many of them were dubious. Having grown up next to my aunt, who raised chickens, I know the merits of farm fresh eggs and what chickens are supposed to live like. 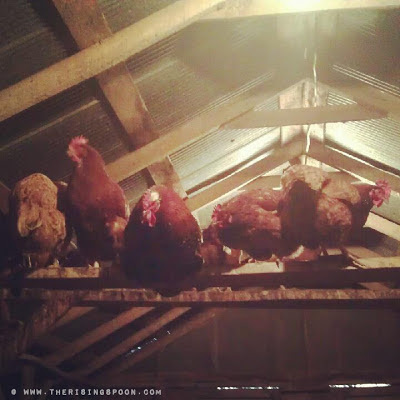 These are happy chickens roosting in a barn at my sister's house. Chickens need a dry, cozy shelter (typically called a coop) for roosting at night above ground level (to keep them safe from predators like coyotes) and laying their eggs. In addition, they need access to a "pasture" or open outdoor space to run around and socially interact (yes, chickens are very social creatures) in the fresh air during the day. Despite what some of the egg labels insinuate, chickens are NOT vegetarians, but omnivores! They love to eat bugs (especially grubs) and happily dig in the dirt searching for them. They'll also use the dirt to give themselves dust bathes. Chickens love kitchen scraps, which is a great way to recycle vegetable peelings. Besides that, they need fresh water and grain daily. They're easy animals to look after. Give them these basic things and they'll produce healthy, delicious eggs and meat for you. If you're interested in raising your own chickens (it's really easy as long as you have the space), check out Oh Lardy's Guide to Keeping Backyard Chickens. The chickens born and raised on commercial CAFO (Concentrated Animal Feeding Operations) "farms" (essentially factories) live in wretched, unhealthy conditions. Most spend their whole lives in tiny battery cages that are no more than 67 SQUARE INCHES, others are cramped with thousands of other chickens inside a HUGE, dark building with no genuine access to the outdoors. There is feces all over, which fills the air with ammonia, making it practically unbreathable. These ghastly conditions of course breeds hundreds of types of diseases and ailments for the chickens, which are either treated with antibiotics or not, depending on the label. Commercial chickens don't have space to perform the habits natural to them: roosting, perching, scratching, stretching, dust bathing, digging, running, etc. Many chickens have their beaks trimmed as a chick to prevent them from pecking as a result of their confined conditions. That's akin to having your fingers cut to the second knuckle for a human. Lots die of starvation as a result of this, because it's too painful for them to eat. Other chickens, especially older ones, are starved on purpose in a process called "forced molting", which stuns their bodies enough to lay eggs again. 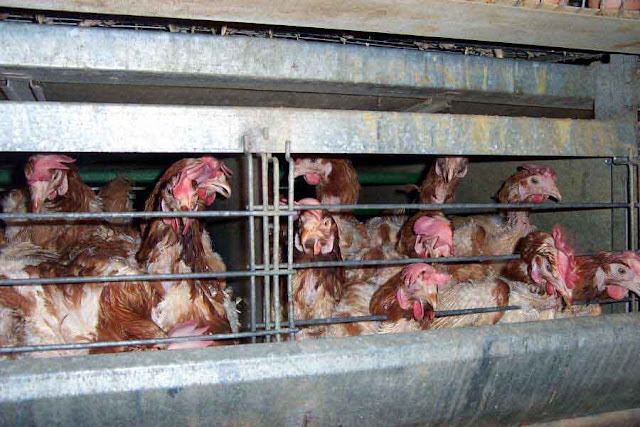 These are battery cage hens from a conventional, commercial egg farming operation. If you're flabbergasted about the animal cruelty and unhealthy conditions occurring in the chicken industry, don't run out and buy a bunch of "free-range" or "organic" eggs in the hopes of supporting healthy, happy chickens and their farmers. I hate to break it to you, but damned near all of phrases used on egg carton labels are LIES. 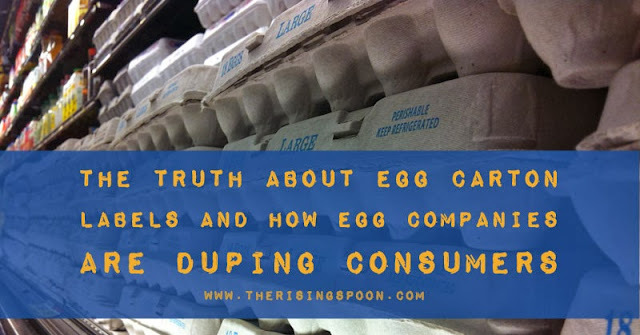 There isn't much regulation in the egg industry and most of these companies' claims aren't verified by a third party, so they can pretty much say whatever they want. White and Brown Eggs: The color of the egg does not affect the nutritional value and is only a cosmetic variable. The color determines what breed of chicken laid it. Believe it or not, some breeds lay blue, pink and yellow eggs! Pasteurized: While not as common, these eggs have been heated in a commercial water bath for sanitization and to kill off all bacteria and viruses without cooking the egg. This labeling has no impact on the chickens' well being and only applies to the eggs. Vegetarian-fed: This means the chickens were fed a grain that does not include animal byproducts. While this is good, chickens are actually omnivores and like to eat bugs, so this label means they don't get access to the outdoors. This label has no impact on the chickens' well being and only applies to the eggs. Omega-3 Enhanced: The chickens were fed a product, most likely flaxseed, to bolster the omega-3 nutrition in their eggs. Because of poor diet and living conditions, the eggs laid by these hens would have less omega-3 in their eggs without the flaxseed. This label has no impact on the chickens' well being and only applies to the eggs. All-Natural and Farm Fresh: These terms means nothing. Companies add it to trick the consumer into thinking their product is wholesome. If there are no other labels or certifications on the carton, these eggs likely came from a battery hen "farm". The chickens live in a windowless warehouse stuffed in a tiny cage about the size of a piece of paper. They are given a feed comprised of animal byproducts, hormones and genetically modified soy and corn. Beak trimming and forced molting are common practice. Cage-Free: The chickens aren't kept in tiny cages; however, this term usually means that the chickens are kept in a large, dimly lit barn-like building or warehouse that houses thousands of the birds. The space is wall to wall with chickens. At least these chickens can stretch their wings and potentially walk around, but it's not much better than the battery hens in cages. Beak trimming is allowed. Free-range and Free-Roaming: Similar to "cage-free" the chickens are kept indoors without cages, but these birds have "access" to the outdoors. However, there are no strict regulations ensuring the chickens actually do go outdoors and if they do, for how long. Typically, these large warehouses have a tiny opening to the outside and that's it. Beak trimming and forced molting is allowed. Organic: If the carton has a USDA Certified Organic label, this means the chickens were fed a vegetarian, organic product that contains no animal byproducts, antibiotics or pesticides. This label has no impact on the chickens' well being and only applies to the eggs. However, according to the Humane Society of the United States, the hens laying certified organic eggs exist in the same conditions as the "free-range" label, so beak cutting and forced molting are allowed. The only difference is the type of feed the chickens are eating and the fact that organic eggs are verified by a third party. American Humane Certified: These chickens live in the SAME horrible conditions as either battery hens or cage-free hens (see above) and the only difference is that forced molting is not allowed (beak cutting is okay) and the chickens are third party verified. Certified Humane: This certification is only slightly better than American Humane Certified because there are actual specifications for "stocking density and number of perches and nesting boxes" and the birds are definitely uncaged, although they are kept indoors at all times. These stocking limitations give the chickens a better chance at achieving natural behaviors, but there is no guarantee. Again, forced molting is not allowed, beak cutting is okay and it's third party verified. Food Alliance Certified: This is exactly the same as Certified Humane except the birds are required to have "access" to the outdoors or natural daylight. This may mean there is only one or two tiny doors for going in and out, which doesn't guarantee any or all of the chickens see the outside. Again, this is third party verified. Animal Welfare Approved: In my opinion, the best and most humane alternative to small farm, pasture raised eggs. According to the Human Society of the United States "The birds are cage-free and continuous outdoor perching access is required. They must be able to perform natural behaviors such as nesting, perching and dust bathing. There are requirements for stocking density, perching, space and nesting boxes. Birds must be allowed to molt naturally. Beak cutting is prohibited". Pastured or Pasture Raised: Like I wrote in the above paragraph, "How to Raise a Healthy, Happy Chicken", a pastured chicken spends most of their days (literally, during the day) outside, possibly in a pasture. They are fed a healthy diet of grain and kitchen scraps, plus any bugs that they dig up and eat while scratching in the dirt. They have the space to perform all of their natural behaviors, are not abused or starved in the name of egg laying and have a safe, warm and dry indoor shelter (coop) to roost and nest at night. If you see this label on a store-bought egg carton, ONLY TRUST IT if it also has the Animal Welfare Approved label. This means that a third party has verified the chickens are indeed living in these great conditions. Alternately, you can call the farm directly and ask questions about their living conditions. Even better, visit the farm! And ideally, you'll bypass the store all together and buy pastured eggs directly from a farmer or farmer's market. Now that we've discussed what the commercial, conventional, store-bought and factory-farm egg carton labels really mean, let's talk about how nutrition comes into play. Common sense should tell you that food from a healthy, happy animal or plant is better quality and more nutrient dense than food consumed from a sickly, tortured and/or neglected animal or plant. However, some people need scientists, professionals or officials to tell them things before they'll believe. I can totally understand this sentiment, since I'm a rather logical person. Back in 2007, Mother Earth News conducted their own Egg Testing Project, which tested six eggs each from 14 different flocks of pastured chickens and compared the nutritional results to those officially provided by the USDA for their conventional, caged eggs. The pastured egg testing was performed "by an accredited laboratory in Portland", Oregon. While these results are promising, I know that many people will look at them and immediately question why Mother Earth News did not test conventional eggs at the same time, as opposed to relying on the USDA's own statistics. Thankfully, Cambridge University Press published a study entitled "Vitamins A, E and fatty acid composition of the eggs of caged hens and pastured hens" in their multi-disciplinary journal Renewable Agriculture and Food Systems in March 2010. The study was conducted by four researchers: H.D. Karsten from the Department of Crop and Soil Sciences at The Pennsylvania State University, P.H. Patterson from the Department of Poultry Science at The Pennsylvania State University, R. Stout from the USDA/Agricultural Research Service, Pasture Systems and Watershed Management Research Unit, and G. Crews from the Natural Resources Conservation Service. If that's not enough to convince you, then test out the difference between the two egg types yourself, like I did (see the picture above). Crack open a generic store-bought egg and a local, pasture raised egg side by side and compare the color of the yolks. It's almost always the case that the pastured egg will be a vivid orange color, while the commercial, factory-farm egg will look pale. Then cook it (preferably over-easy or sunny side up so you can taste the yolk separate from the white) and compare the taste. I personally find pastured eggs have A LOT more flavor! But you don't have to take my word for it. 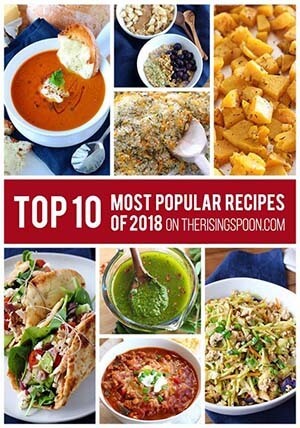 Check out Prisoned Chickens Poisoned Eggs: An Inside Look at the Modern Poultry Industry by Karen Davis or this 72 Page Report published by the Cornucopia Institute. 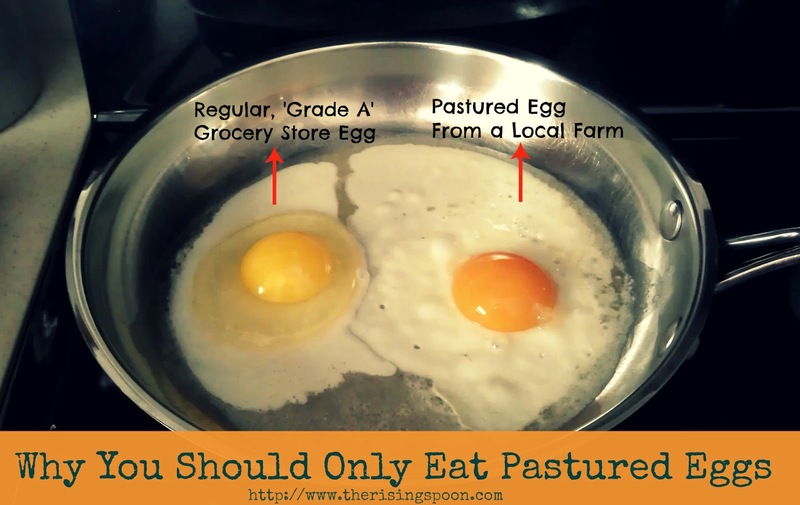 Free range vs Pastured eggs; what's real and what's just a good marketing ploy? What Are The Healthiest Eggs To Buy? When an Egg is not an Egg: what's on your breakfast plate? So What Eggs Should You Buy? You should buy the best quality eggs that you can afford. In most cases, that's going to be local, small farm, pastured raised eggs from chickens that aren't given a GMO corn or soy feed that's full of pesticides and genetically modified. But that doesn't necessarily mean you have to shell out $6+ dollar a dozen to get them. Be smart and look around you community for the best deal. Visit your local farmers market (there might be several of these) and buy eggs directly from a farmer. The prices are often more competitive here than grocery or health food stores. Raise your own chickens! This book and this book are great resources for beginners. What type of eggs do you normally buy and how much do you pay per dozen? nothing extra for you. Thanks!